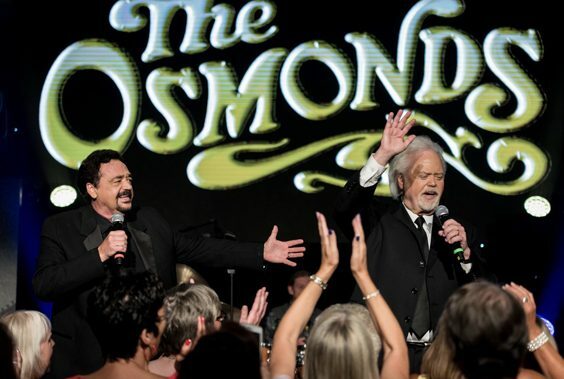 How did you cope with Osmonds fever in the UK? It’s been a whirlwind. I remember when we got here in the 1970s and I couldn’t believe the reception we got. People over here are amazing. So wonderful. How did you guys stay sane amid all the madness of the fandom? Well, we have great parents and I think it has a lot to to do with our faith and the way we were raised, I guess. My parents made sure we were never caught up in all the craziness of show business. I remember when we had success one time, and mom said: “Well that’s wonderful, but don’t forget your chores.” My parents made sure we stayed grounded through the crazy time. Tell us about the current tour. Well, we had our first Christmas show last night in Blackpool, with my brother Merrill, who’s really fun to perform with, and we’ve got singers and a fantastic band. And we’re trying out new things that we haven’t tried before, and the reception was just amazing. What I love about this show is that it’s got Christmas and all the elements that make a good show. It’s got ebb and flow. It’s got quiet parts. It’s not just a rock show. Even though our album is called ‘Very Merry Rockin’ Good Christmas’, and we have a lot of rock and roll Christmas songs in it; it’s back and forth, up and down, and we get into the audience. And it’s really fun to see the guys in the audience sing our songs. Because back in the seventies they were mostly girls. I didn’t realise there were a lot of guys that learned our songs. And I thought ‘How cool is this?’, because our audiences now are totally different. This lady said to me: “These may be your songs, but they’re my songs too. We grew up together.” I was going through passport control one day and the guy on control looked and me, looked at my passport, then started singing ‘Crazy Horses’. He said: “I’m a quiet fan” (laughs). ‘Crazy Horses’ is one of my favourite songs and a reminder of how rocky The Osmonds are. Was it liberating recording that after the softer pop numbers? I like the way that you put it. It was liberating, because The Osmonds have always been in the rock era. When the record company wanted Donny to do ‘Puppy Love’, we were his background; we played all the instruments but the band have always been in the rock vein. So yes, when we did ‘Crazy Horses’ it was liberating, because that was really us. What’s exciting now is when Merrill and I are on stage, we do some rock numbers. We do The Plan, which is one of my favourite albums, and that went off so well last night. We do a whole rock medley of The Plan. What happened to your solo album released in the 1970s, and any chance it could be re-released? It’s called It’s About Time Again. We released it and distributed it mainly to the fans, and we’re thinking about putting it out again. It was fun. You’ve been rated as one of the best drummers in the business. How do you rate yourself? Thank you. It’s hard to say because I’ve been around some wonderful drummers. I’ll never forget being in Earl’s Court in ’73, and Led Zeppelin were going in the day before. We had the same sound people and they invited us backstage and we became friends with (John) Bonham and Robert Plant, and Robert said: “Why don’t you join us at the end of the show when we do ‘Stairway to Heaven’?” So I got right up there with Bonham with the congas and I was playing next to him, ‘Stairway to Heaven’. And I thought: ‘This is so surreal.’ That was put it in my mind forever, playing next to him. My mentor, Ronnie Tutt, who was Elvis’s drummer, and he was our drummer too, he was my first teacher. He went on the road with us, and about six months ago I came over to England and I was invited to play with TCB, that’s Elvis’s band. They invited me to come up and play with them. That was a surreal moment as well, playing with those guys. That was just amazing. Ronnie was out because he had broken his hip, and they invited me to fill in. What an honour. Do you think The Osmonds are now recognised for their skills as musicians compared to the early days when the fame overshadowed that ability? Well we did play most of the instruments on our songs. In fact that’s how we wrote most of our songs. We would always start with the drum beat, so the brothers would say “Give us a ‘feel’”. So I would start with the drums, then Merrill would give it a bass ‘feel’. Then usually Wayne would go and Alan would take it after that. And we would write songs like that. How did The Osmonds break into showbusiness? Well Walt Disney actually discovered us. He had us singing at Disneyland and he put us on four of his television shows. I was six years old. And that’s where Andy Williams’ spotters discovered us, and we were on his show for about nine years. It started with the four brothers, then Donny joined us. What was interesting, every week we had to do something different on Andy’s show in front of 40 million people, so we brought our brothers Virl and Tom on, and then Marie joined us, so we changed it to The Osmonds, and then Jimmy would join on and off, once in a while. But it mainly started with the four brothers, then five when Donny joined us. What are you looking forward to when you come back to Yorkshire? Well, first of all that is one of the most beautiful areas of England. My wife and I almost moved to York. When we come to do the show, we just look forward to seeing the people, and celebrating Christmas and the true meaning of Christmas. It’s a whole gamut of celebration. It’s going to be a wonderful time. A wonderful time of year and we love doing the Christmas shows. It’s just a fun show. Finally, how surreal was it seeing yourself as a cartoon character in the 1970s TV series? Well it’s so funny you say that. When I was dating my wife, she said: “You know what? You remind me of a cartoon.” So I played her a cartoon of me, and she just about died (laughs). Because she had no idea that we had cartoons of ourselves. 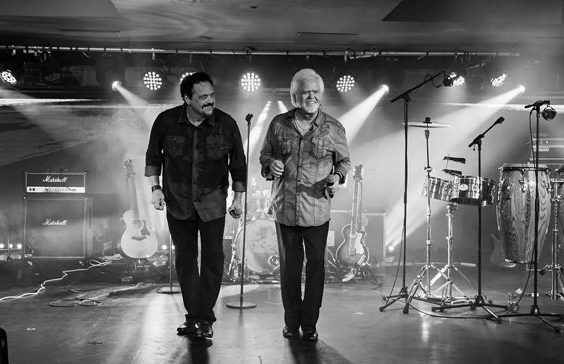 Jay and Merrill Osmond bring their Rockin’ Christmas musical spectacular to Doncaster’s The Dome on December 12, 2018. The album ‘Very Merry Rockin’ Good Christmas’ is out now.